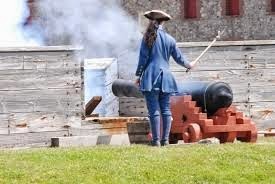 Cape Breton Tourism Spotlight: Have a Blast at Louisbourg-Brand new Louisbourg Fortress Experience!! !Come try it out! Have a Blast at Louisbourg-Brand new Louisbourg Fortress Experience!! !Come try it out! Brand new experience at the Fortress of Louisbourg. Come be part of the fun. Have a Blast at Louisbourg! Be a Cannoneer in Training. This experience could be yours from 10:45am to 12pm daily from July 1st. to September 1st. Cost $36.80. How many of us have had the chance to fire a cannon? Better yet, a cannon identical to the ones that defended Louisbourg in the 18th century. You now have the opportunity to do just this every day of July and August at the Fortress. Thirty minutes and you will know enough of the French colonial artillery science to fire an impressive cannon that can send a cannonball two kilometres away! Book your experience today. Makes a perfect gift for the men in your life.